I can’t express how your sensitive and profoundly respectful work touches me:where I often focus my gaze on the fleeting moments of life, you’d rather invite us to share in the hopes and difficulties of others that you manage to capture earnestly and yet very creatively without ever falling into sentimentality or trophy hunting . Thank you so much. Please take care. I’ve always loved the movement in this photo. I long to go back there on my little scooter on a warm ( by Northumberland standards ) spring day. 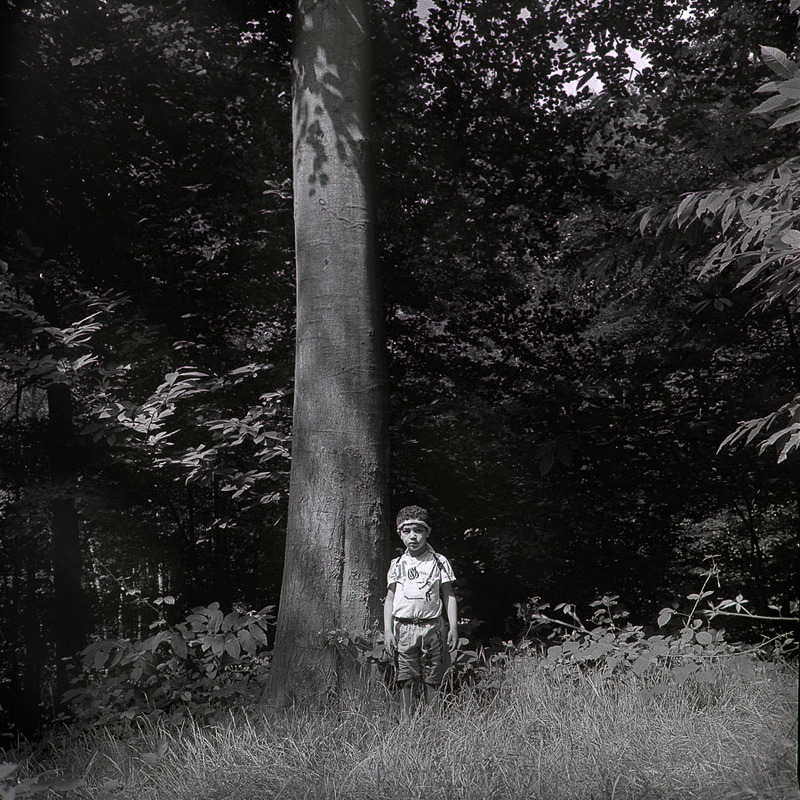 W, a Boy in the Woods:a Portrait. France early 90s Mamiya C330 with Tri-X pan. likes to be printed big. Epson V700 scanner versus Nikon D800+Nikkor 105mm Macro . And the winner is ? Epson V700 scanner versus Nikon D800+Nikkor 105mm Macro . What would you expect? 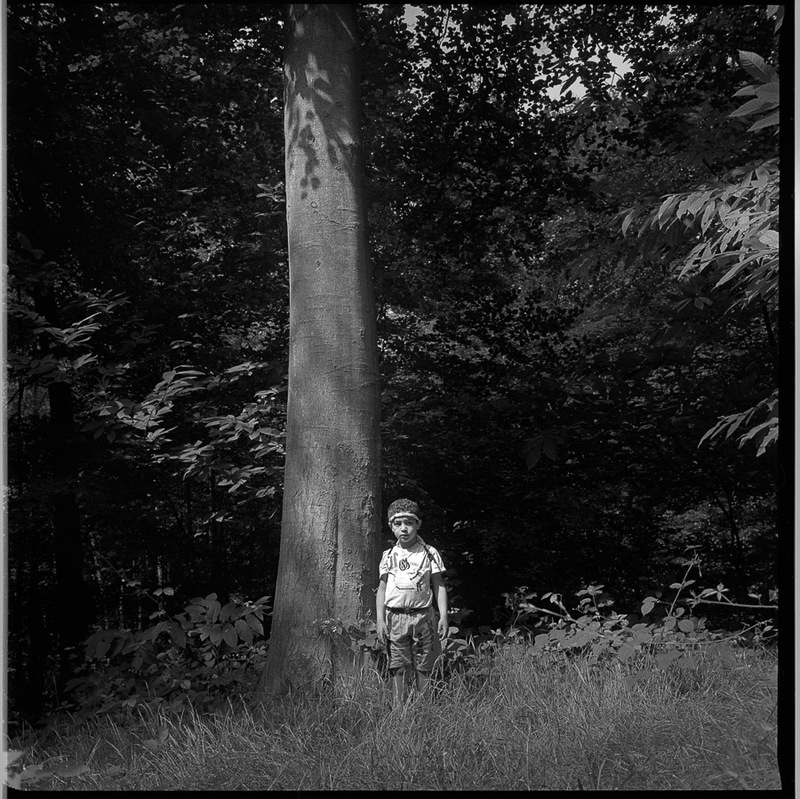 W , boy in the Woods from a digital copy of a Medium Format Tri-X Pan negative. 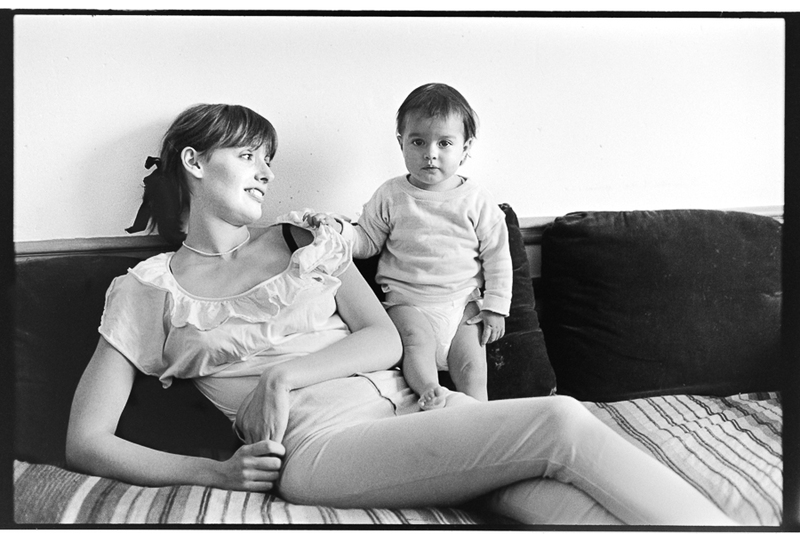 Early 1990s .France. To Scan or to Copy ? That is the Question. 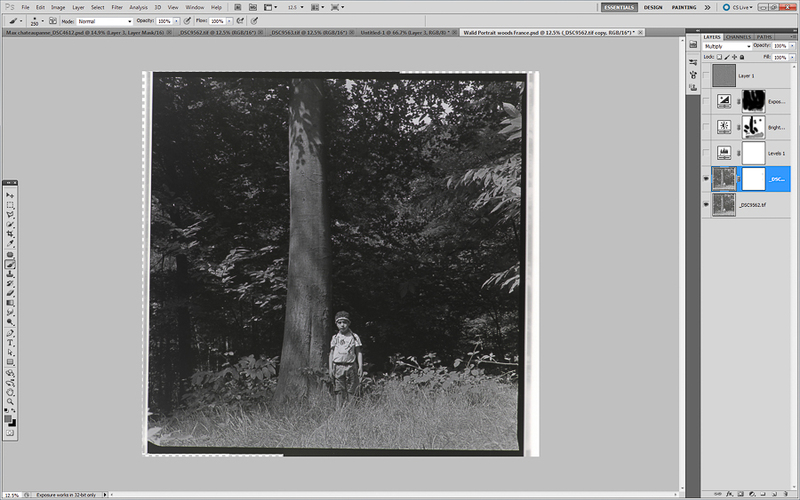 I have fair sized analogue archive, a mixture of 35 mm and roll film negatives that I processed and enlarged myself. I invested a few years back in an Epson V700 scanner and have been frustrated by the results especially with 35 mm film but even with roll film . Wet mounting the negatives or sending them off to be drum scanned was never going to be an option for me so of course I became highly interested in the possibilities of using a camera to copy the negatives in the hopes of getting better results. I have asked myself if the results that I were unhappy with could be as much down to my poor operating skills as to the limits of the V700 and of its native software. 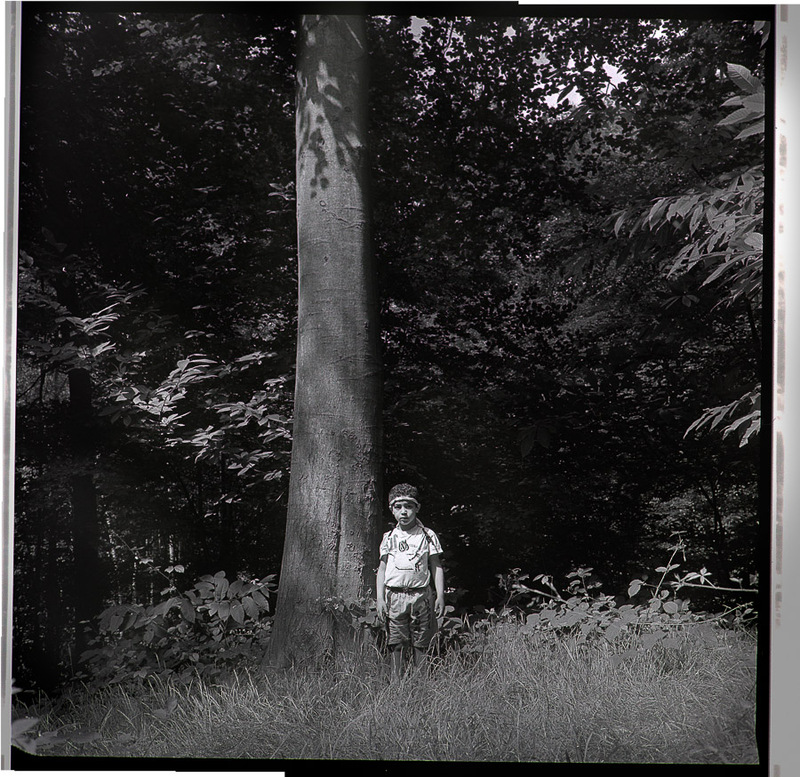 I know I said I was more frustrated by my results with 35 mm negatives but nevertheless I chose to carry out my first attempt with a roll film negative, because I new it was a “good negative”. It is an image shot with a Mamiya C330 twin lens camera ( which I used to call affectionately my coffee grinder because of the noise it made when you armed it ):not the sharpest animal on the block, prone to vignetting, but one I could afford. It was captured on Tri-X pan. Because I was always keen to get good details from the shadows to the highlights, I used it at 100 ISO instead of the recommended 320 and developed accordingly which incidentally reduces the graininess . I’d never printed this image but that’s another story:the negative told me it would be good and that I at least would really like it.Other reason for the choice:it is a very clean negative and its subject matter is little prone to revealing minor dust and scratches , uneven development or uneven lighting by the light-box. This could of been a whole different ball game with a wide open sky or a snow scape, or with a colour negative (mental note:try it with those types of negatives ). Once I set up the camera and 105 macro , with the negative in a holder,emulsion upwards, just resting on the light-box ( battery operated, rated 5000 C° ) in the subdued light of my study , I realised I could get quite close to maximise the resolution offered by the camera and took two overlapping images of the negative that I planned to stitch in Photoshop (CS5 ). I set the camera to aperture priority mode at f5, thinking I had dialled in ISO 100 when actually it had reset itself at ISO 1000 (I’d inadvertently set it to auto-ISO mode and it had cranked itself back up ) ! Shutter speed for those settings was around 1/640th of a second:well enough to avoid mirror shake that I didn’t bother to put up. This generated two files that I imported into LR 5 that I opened as Tiffs ( Adobe RGB , resolution 300 16bit depth LR preset) in PS 5. I am sure that PS experts might of gone about editing this image differently but this is how I went about it to my satisfaction. Stitched using PS and inverted:pretty soft but the information is there. Levels adjustment layer:it’s starting to come to life. 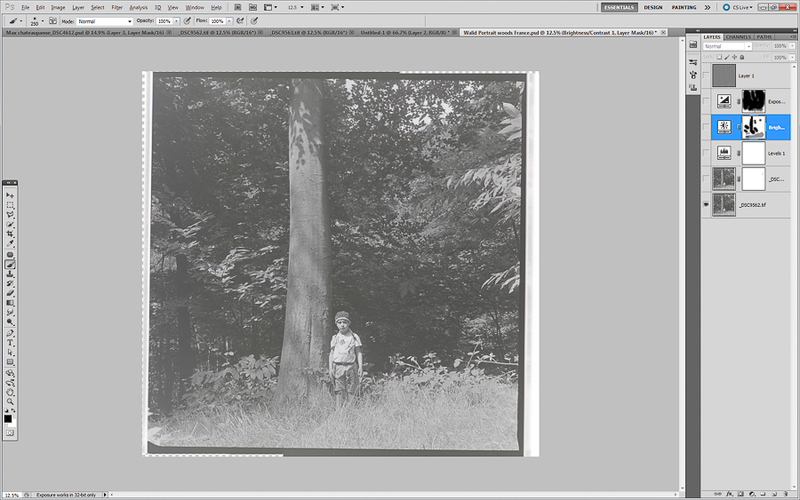 A few adjustment layers on, nothing I wouldn’t of done in the darkroom using good old burn and dodge,and sharpened using the high pass filter layer ) and cropped I obtained with out resizing a 60 cm by 60 cm image at 300 ppi. 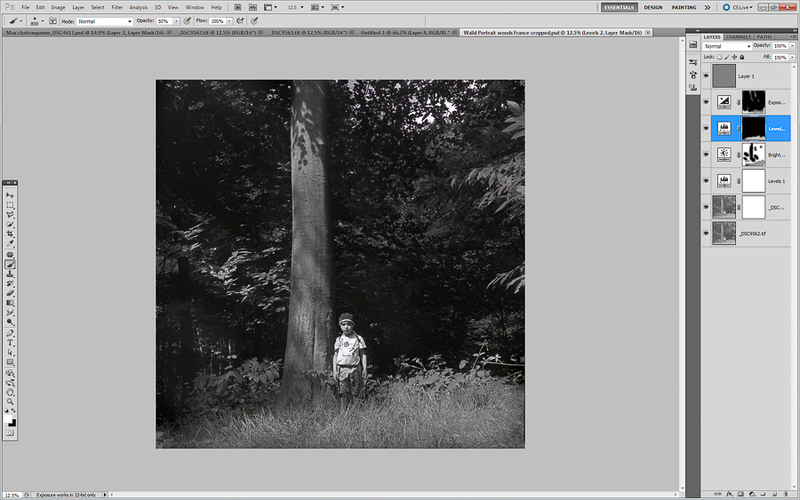 Et voilà, with the full tonal range I was after. Good enough for me. 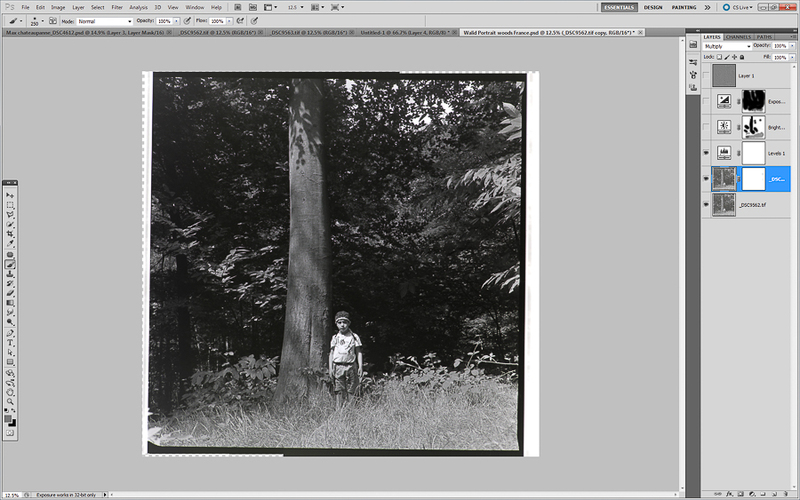 To be a fair test, I scanned with the native software of the Epson to produce a Tiff file of similar dimensions taking care to not use any of the in-house scanning options ( unsharp,grain reduction,backlight,dust removal ), that in my experience create more problems than they solve . After careful editing of the scan in PS, I achieved something very similar ! 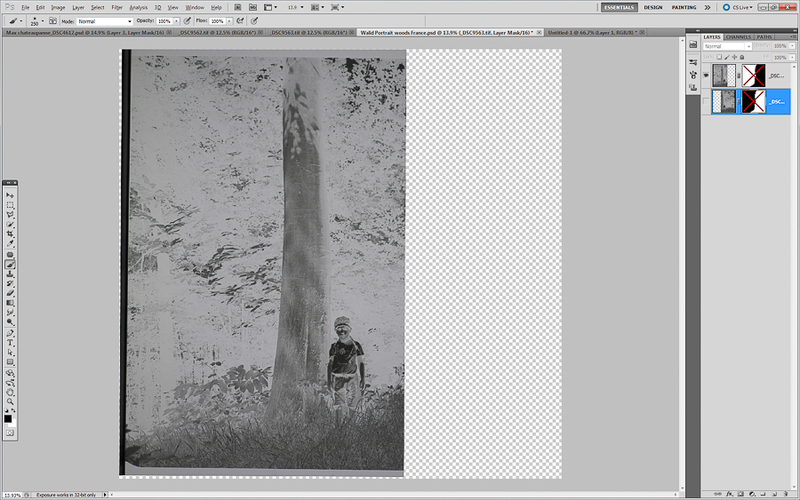 The only significant difference is that it needed no sharpening. 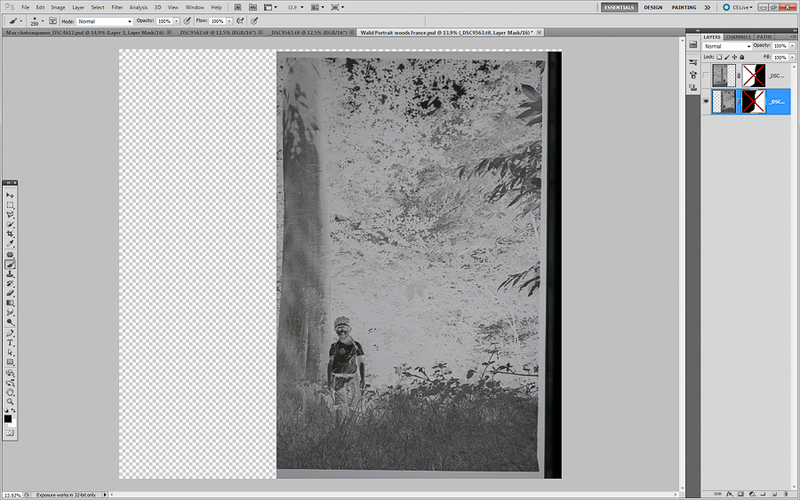 At this point , I thought it was time to compare with a 35 mm negative. There’s no exif file to tell me how I processed it, but from memory, in 1986, I used Tri-X 35 mm film at ISO 400 and developed to the Kodak’s specs: “faster” film but at the cost of dynamic range (shortened ) and fineness of grain. I chose the following image because it seemed to display a good range of tones if slightly underexposed in the shadows:challenging to print in a wet lab but not impossible either. Now I couldn’t get close enough to cover more than the sensor. 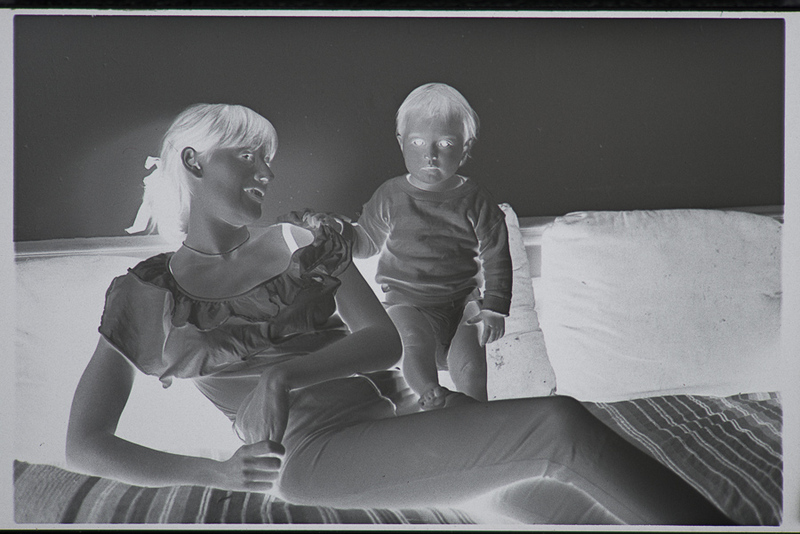 I took a few different expositions and settled on this negative that seemed to present as much information as possible. I believe in good enough; I don’t blow up images to hunt out differences I couldn’t spot with my naked eye at print size and appropriate viewing distance. And as far as good enough is concerned both techniques allowed me to get as much information from the negatives as possible and to convert them into workable digital negatives. I scanned those negatives years ago but didn’t produce half as good images from them as I have today;that’s why I wasn’t blown over by the V700 and had high hopes (and was pretty convinced) that the D800+105 mm macro combo would outshine the V700. I was wrong because I didn’t factor in that LR and PS have evolved since I purchased the V700 and so have my set up and skills.The only major advantages the D800+105 mm macro combo has over the V700 are speed and sharpness. 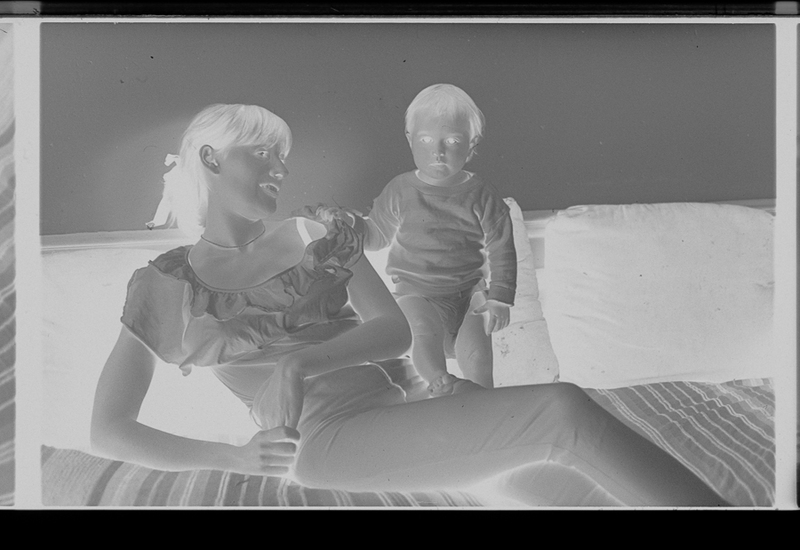 It takes a few minutes to scan a negative at high resolution and a few more to set up scanning another whereas with the camera-lens combo it takes seconds to scan and seconds to set up to scan another:a very good reason to opt for the camera-macro combo if you’ve got loads to do. As ever a tool is only as good as it’s user, and as far as this user is concerned, both produce workable digital negatives from my 35 mm and roll-film negatives,except that using the camera is much faster.If you have a similar camera -macro combo but no scanner, I wouldn’t rush to buy one,as far as black and white negatives are concerned:just get a cheap light box and use your camera stand to copy the negatives. I hope you found this interesting. I am not a photo savant, so it is highly likely that I haven’t quite grasped all the pros and cons of the issues at hand here and welcome all helpful comments ,knowledge, insights and experiences . On the road home from Skye. Sur la route du retour de Skye. Taken in 2010, edited and printed today on epson 3880 on Harman Glossy A2. A fairly classic black and white landscape, I hope it’s not too “Ikea” if you get my meaning. Un paysage noir et blanc assez classique. J’espère qu’il n’est pas trop dans le style “Ikéa” si vous me comprenez. Cheerleaders in Dorset, I like a well structured busy street photo where many things are going on. I have made a tighter crop version but in the end this one says more. Walking back from a stroll around Malham Cove. I’d forgotten the aim of this blog: to share photos that matter to me and offer now and again a word about photography and photographers; I was so busy thinking about where to go next with (my ) photography that I couldn’t bring myself to post. Yes, I am for the first time in my life thinking of going beyond being a little Jacques Henri-Lartigue photographer of my world. I’ve always submitted photos however personal with the hopes that a tiny element in them might appeal to viewers other than myself, might resonate with their own experience and emotions and I offer you this portrait of my J with the same hope. Life is over before you know it: a damp trail in the North, a bit of light through the mist, a shout to my J that turned to smile at me, an instant , a treasure, it’ll never happen again just like that…Yes a photo I really care about .